To put it simply: link your AdWords and Google Analytics accounts and enable auto-tagging, and you’ll start receiving a new set of detailed reports on things like day parts, destination URLs and keyword positions. These automatic reports show exactly how your search and display campaigns are performing and offer rich insights into the kind of users they’re driving to Google Play. Any user of both AdWords and Google Analytics can have this set of reports by just enabling auto-tagging. We handle the rest, so you can focus on optimizing rather than manually tagging AdWords campaigns. These new reports can be found under the Acquisition menu for Google Analytics App Views. They’ll become visible to everyone over the next few days. Check the Campaigns report to better understand users being driven into your app, and see how they use your app. 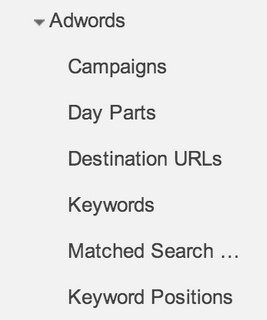 Find out from the Day Parts report when users are interacting with your campaigns. Use Search reports to find out which keywords and search queries are acquiring the most new users. Ad campaigns should help you find the best customers. These new reports go a long way towards identifying them. Whether you track in-app revenue or specific goal conversions, you’ll be able to tie user quality to the campaign that brought them to your app. We hope you’ll find these new reports useful. You can get them running by linking accounts and enabling auto-tagging today. Today we’re happy to announce a deeper integration between AdWords and Google Analytics for Mobile Apps that will help advertisers make faster and better decisions about marketing their apps. You find that one (or several) of the pages on your site is missing Google Analytics, or some pages had Google Analytics deployed twice causing duplicate pageviews and inflating traffic. Google Analytics custom variables were inconsistent or missing on some portions of the site, leading to data quality issues. An unauthorized marketing tag was piggybacking off of another tag. One of the tags on an international site you managed did not follow the new EU Cookie Laws related to privacy. 1. Know where you are – what tags are currently firing, where and how? Whether you have a small site with a few hundred pages or an international publication with thousands of pages, it is important to assess your current tag deployment. Can you say, with 100% confidence, that your analytics tag are located on every page? 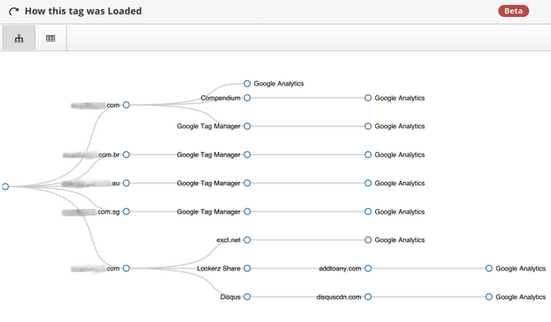 Are you sure the cookies set by your analytics tag/tool are accurate and not over-writing each other? All the tags on your site, split up by specific pages’ tags, and even pages they are missing from. Cookies set by various tags and what pages they are set on. How the tag is deployed – through a tag management system or directly from a page source. Instances of tag piggybacking – one tag being loaded by another tag. 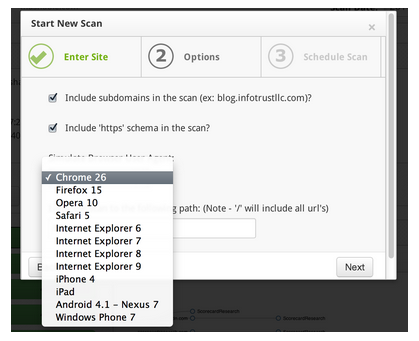 Here is a screenshot from an example scan. It shows how tags load (commonly referred to as tag hierarchy). We have removed the website URL, but as you can see there are instances when Google Analytics is being loaded by the TMS, and instances where Google Analytics is being loaded directly from the source of the page. Check out Tagopedia – a wiki of tags to learn more about the many different types of tags. 3. Consider the implementation of a Tag Management System. There is a reason this is step three, and not step one or two. A lot of companies jump to this step first, thinking that a new technology will miraculously make all tagging issues disappear. The first step in moving to a TMS is knowing what tags you need to keep, and where they are or how they are loaded on your site so you can remove them from the source after the tag management system is deployed. When considering the implementation of a tag management system, think about your team. Every website of a TMS vendor says you will no longer need your IT team to make changes to the tags thus simplifying and expediting the process. I have met plenty of marketers who do not want anything to do with a TMS. Even though you will free up your IT resources, you will still need a person or team with the technical training to manage your tags. Naturally, your first step in evaluating Tag Management vendors should be outlining what features you really need. Google Tag Manager is free, and is one of the few TMS systems that works for both mobile websites and native mobile applications. NOTE: If you do decide to migrate to a TMS or if you have already done so, you still should scan all the pages across your site to ensure that your tags fire correctly, such as, once per page for analytics tags – and only from your TMS. You certainly want to avoid having a tag in the source of your page and inside a TMS – this will inflate your data and cause data quality issues. 5. Think ahead – will you be able to innovate? Complete lock down is in nobody’s best interests. What happens if there is a new platform for A/B testing that you would like to try? How long will it take you to get the tag approved, implemented on your site, verify its performance, and launch a campaign? Keep innovation in mind and make it relatively easy for marketers in your company to adopt new technologies. One way to go about this is having an application that needs to be completed and approved prior to implementing a new tag. This will help you ensure only tags that meet company standards are implemented on your site. At the end of the day, tag deployment and data collection will only get more complex. If you do not have any process for managing your tags, it is time to start. If you have some kind of process, perhaps it is time for optimization. Get all the stakeholders in the room, and decide who will be your tag management team, and what the first step will be to ensure tag accuracy. You can’t do analysis if the data isn’t accurate. And your data won’t be accurate if your marketing tags aren’t implemented correctly. If you would like to learn more about implementing a tag management policy, we would like to invite you to attend a free webinar on March 26th at 1:00PM EST where we will discus items outlined in this post, and a lot more. The following is a guest post from GACP Michael Loban, CMO at InfoTrust. is a leading UK retailer of premium, pre-owned watches. The company was founded in 2002 as an online-only store selling watches from more than 80 premier manufacturers. Today, it has an annual turnover of £25 million and has recently opened a flagship boutique in the London Royal Exchange. Considering the average order value on Watchfinder’s site is over £3,500, the company found buying decisions tended to take time, often spanning weeks or months. In fact, less than 1% of visitors were completing purchases on their first site visit. Watchfinder’s challenge was to re-engage and also maintain a conversation with these visitors, encouraging them to return and make an order. In addition to driving customers back to its site, Watchfinder also wanted to encourage customers to visit its new physical boutique in the London Royal Exchange. Watchfinder’s agency Periscopix – a Google Analytics Certified Partner – suggested Remarketing with Google Analytics as a great way to reconnect with users. 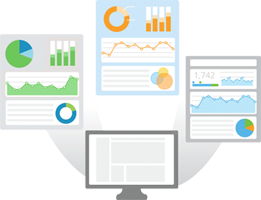 Remarketing with Google Analytics allows advertisers to tap into valuable insights about website visitors who show an interest in products, identify the most relevant audiences, and run ads across the Google Display Network that are tailored to that audience using the industry’s most powerful segmentation capabilities. Periscopix created 20 highly focused lists of visitors who demonstrated intent but did not purchase. Specifically, lists were based on various aspects of user context such as location, language, and what stage of the purchase funnel they were in. On-site behavior helped establish groups that had spent a certain amount of time on the site or had viewed a certain number of pages. Other lists were created around users who had viewed a specific watch brand on the site. Additionally, traffic performance analysis across a variety of GA dimensions revealed that certain ISP’s in the London financial district yielded traffic with much higher engagement and above average conversion rates. As a result, Periscopix designed segments around investment banks like JPMorgan and Goldman Sachs to engage with employees at these companies. Thanks to clear reporting in Google Analytics, it’s been easy to see the impressive results from Watchfinders’ remarketing campaign. Six months in, Periscopix reveals the return on investment is 1300%. Average order value on the site has also increased by 13%, resulting in 34% lower CPAs than Watchfinder’s non-brand search campaigns. Across all tactics used, the remarketing list that produced the highest conversion rates, both in terms of goals and transactions, was made up of visitors who browsed for 10 minutes or more on their initial site visit without purchasing. Given Watchfinder's early success with Remarketing with Google Analytics across the Google Display Network, the brand is excited to increase investment in this area going forward. Watchfinder is a leading UK retailer of premium, pre-owned watches. The company was founded in 2002 as an online-only store selling watches from more than 80 premier manufacturers. Today, it has an annual turnover of £25 million and has recently opened a flagship boutique in the London Royal Exchange. A lot of companies are reinventing themselves for mobile today, and we’ve been working hard to make sure Google Analytics Premium can help them measure all those new cross-device journeys. The goal, as always, is to help businesses gather meaningful data, easily discover insights that they can act upon to improve results and boost the bottom line. 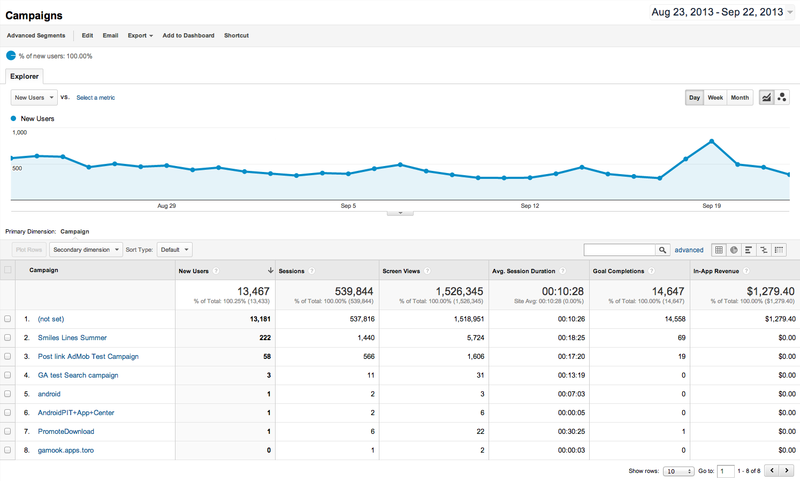 Learn more about Google Analytics Premium here. Google Analytics Premium lets Zillow grow and scale their company.